One of my colleague/friend from Prague, visited us for dinner yesterday, and I had to prepare something which is mild, with less spices, as suitable to his taste buds! Then the dish which came into mind was Butter Chicken… it is so mild and tasty at the same time. One advantage in this recipe is that, it can be made as mild or as spicy as one wishes without altering the actual taste. This dish is among the best known Indian foods all over the world. I have adapted this recipe from chef Sanjeev Kapoor’s popular food show “Khana Khazana” on Zee TV 🙂 From the time I was little young, I used to sit in front of TV, by the time the program starts, with a pen and paper and note down the ingredients and method carefully 🙂 I really like the way he makes the show and recipes interesting!! Hang yogurt in a muslin cloth for fifteen to twenty minutes to remove extra water. To this add red chilli powder, salt, ginger-garlic paste, lemon juice, garam masala powder and butter. Apply this marinade to the chicken pieces and refrigerate for three to four hours. Put the chicken onto a skewer and cook in a preheated oven at 200°C for ten to twelve minutes or until almost done. Remove and keep aside, for further use. Heat butter in a pan. Add green cardamoms, cloves and cinnamon. Saute for two minutes, add ginger-garlic paste and chopped green chillies. Cook for two minutes. Add tomato puree, red chilli powder, garam masala powder, salt, red food color and one cup of water. Bring to a boil. Reduce heat and simmer for ten minutes. Add honey and powdered kasoori methi. Add cooked tandoori chicken pieces. Simmer for five minutes and then add fresh cream. Serve hot with Naan, Parantha or Steamed Rice. Feed A Hungry Child is a non-profit organization formed by V.K. Narayanan of My Dhaba. This is a mission to come together and fight against Poverty and Hunger. Visit this page to learn more. * Join the fight against global poverty. * Help feed hungry children one by one. Larger Vision: feeahungrychild.org aims to improve the lives of a good many underprivileged children in their efforts to support themselves, their families, and their communities by giving them the chance for better food, better education, better healthcare, and other welfare. How can I help? With the help of volunteers, FAHC has begun its support to a pilot batch of 14 children and their families since April 2007 out of which 8 children are girls. Please see the event report for details. This year we are also fundraising to support more children, so would be extremely grateful of any help or contributions you can give to FAHC. Funds from FAHC programs go directly to the children and their families. We do not have any paid employees or any other direct administrative expenses. This year FAHC is also fund raising to support more children by “Donate Smiles” drive and the goal is to raise $3,360 by October 23, 2007. If you want to make a one time donation, click on the ChipIn widget below to donate securely via PayPal online. You can win some fabulous prizes for the donations equal to or more than $25. So Chip In and Spread Smiles!!! A big Thanks to every who participated in this noble cause, and gave donations generously!!! I congratulate all the volunteers who encouraged this act and who sponsored the gifts. Please click here to know about the results and the winners! I once again Thank everyone who made this a big success!! ← Pickled Deviled Eggs and "Egg Mice"!!! I rarely make this as my version needs cream but yours look so delectable!! !a must try, cinnamon!! 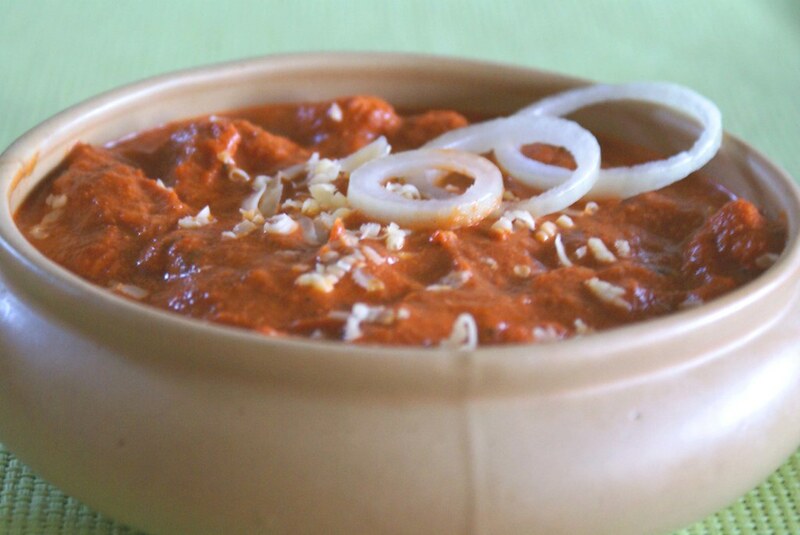 Butter chicken is one of my favourites…am drooling over yours. Asha: This is a fav for all the kids!! Sirisha:Iam sure your husband will love it! I just love butter chicken, and this looks out of the world! browsing the blogs with an empty stomach is not at all a good idea, especially looking at a rich looking chicken dish!!!! I love Sanjeev Kapoors recipe’s they so simple yet rich with flavors and taste. That butter chicken looks awesome Spanz! no onions? yippee. will be trying this soon. Hi Cinnamon, new template is superb with yummy butter chicken recipe. Looks colorful and yummy. Thanks for sharing. Wow love butter chicken. One of the most famous dish from India abroad. I’ve never tried making butter chicken at home. All the versions I’ve had so far in restaurants tasted like absolute trash….so never built up enough enthusiasm to make at home. BUt here you are extolling its mild nature and how its perfect for everyone….hmmm, might give it a try someday then. Looking perfect like we get in restraunts. will try this. And yes Sanjeev Kappor he explains about the dish so wonderfully we can’t turn our eyes from the show. even i watch the show. whenver we order butter chicken, i wonder how the gravy is so thick! lovely recipe.. I know it’s silly but every time I think of butter chicken, I think of chicken in a lot of butter 🙂 Yours looks so rich and creamy. hi there, lovely post…this was just a restaurant baby for me, till happy cook came up with it sometime back, and now you…thanks for sharing..and my my!! !..the deviled eggs are just fab!!! Bee, do try and let me know how u liked it! Happy Cook, hmm yes, it is so famous that every time we visit the restaurant, we always end up ordering the same dish! Nabeela, This one worked for me, do give it a try! Saju, do try it, I am sure u will love it. Apple, Mandira, Nags, Thank You Girls!! I am glad you liked it! Manasi, Paneer must also go well with this gravy, do try and let me know, how it worked! Kitchen Scientist, Thank You.. Ia m happy u liked it! 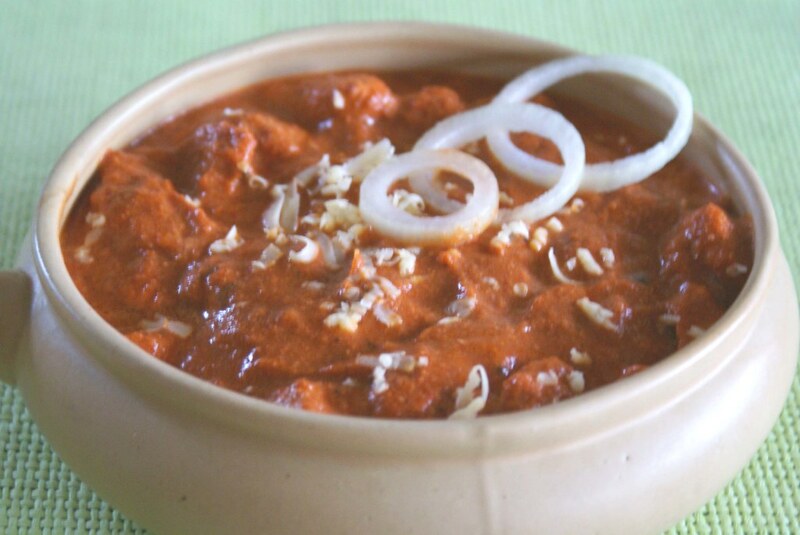 Lovely butter chicken….served it at pot luck last night..everbody loved it..